Announcing our annual party at Affiliate Summit West in Las Vegas. 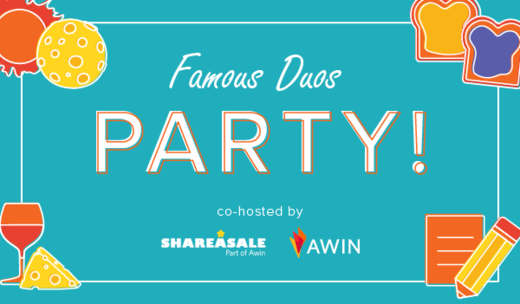 This year, we are so excited to be co-hosting the party alongside our counterpart, the other half of our “famous duo”, our partner network, Awin! Don’t forget to RSVP to save your spot! WHO: Any ASW attendee – RSVP only! Join both ShareASale and Awin as we, once again, return to JEWEL Nightclub in the beautiful ARIA hotel for an open bar, impressive DJ, lots of networking, and a plethora of party favors. This year’s party theme is ‘Famous Duos,’ so expect double the trouble and double the fun. Grab your Affiliate Summit squad and bring on the coordinated costumes. Stay tuned for more costume inspiration. Sorry, this event is sold out. We hope to see you at the ShareASale + Awin Booth #201 during ASW 2018!